May 2015 n Performance & Hotrod Business n 29 Is less really more when it comes to engine size versus competition on the track? Fans will decide as the season progresses. The setup was designed with the help of team engine builders and the OEMs, and reduces the air-fuel mix so the engine will run with about 125 less horsepower. NASCAR estimates that it should drop down power from 900-plus-hp to about 775 hp. The tapered spacer is different from the restrictor plate used at NASCAR's two fastest tracks, Daytona and Talladega. The spacer, with bigger holes for the fuel-air mix than the restrictor plate, is being used at all other tracks and creates a very dif- ferent flow going into the intake than the flat plate. That tapered spacer is now combined with new rules on rear-end ratios to drop engine rpm in an additional move to make engines last longer. Previous in-race rpms were 10,000 and above, and should drop to 9,000 or so depending on the track and engine. Nonetheless, the new spacer has dictated a complete redesign of the intake, ports, exhaust and heads and everything else involved with the flow of the fuel-air mixture. One engine builder even told us smaller valves might be the way to go. The teams have been flogging new designs since the rules dropped late last year, and are now hot-and-heavy into the season. With NASCAR's new rules reducing the num- ber of track tests teams can use, the R&D departments of teams have taken on even more importance. When the rules, which include the new use of roller rockers, were first announced, Doug Yates, CEO of Roush Yates, said, "The engine configuration as we know it is going to change considerably and what that means is a different camshaft. They're going from flat tappet to roller lifters, which is a step in the right direction for longevity. But as far as the cam design, the cylinder head, intake manifold and exhaust system—all of those things that are related to airflow—are going to have to be devel- oped and tested." Yates continued about the rules, "In a lot of ways, it's not a total tear-up by any means. Gene Stefanyschyn and the guys at NASCAR have done a good job of talk- ing to the engine builders and trying to get our input and feedback on how we would like to go about it, and that pro- cess went through many different ways of reducing power. But at the end of the day, I think we as a sport have made a good cost-effective decision going forward for the engine shops and the teams and the sport. There are a lot of ways you can do it, but this makes sense for the current engine we have today." 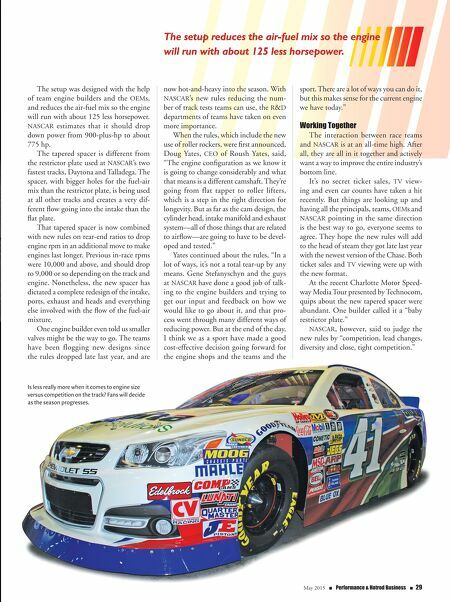 Working Together The interaction between race teams and NASCAR is at an all-time high. After all, they are all in it together and actively want a way to improve the entire industry's bottom line. It's no secret ticket sales, TV view- ing and even car counts have taken a hit recently. But things are looking up and having all the principals, teams, OEMs and NASCAR pointing in the same direction is the best way to go, everyone seems to agree. They hope the new rules will add to the head of steam they got late last year with the newest version of the Chase. Both ticket sales and TV viewing were up with the new format. At the recent Charlotte Motor Speed- way Media Tour presented by Technocom, quips about the new tapered spacer were abundant. One builder called it a "baby restrictor plate." 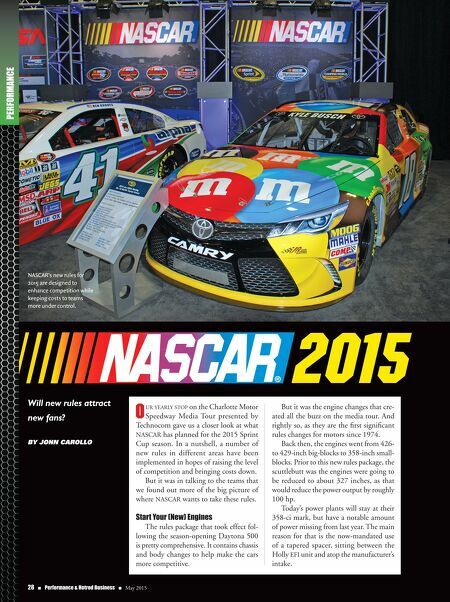 NASCAR, however, said to judge the new rules by "competition, lead changes, diversity and close, tight competition." The setup reduces the air-fuel mix so the engine will run with about 125 less horsepower.